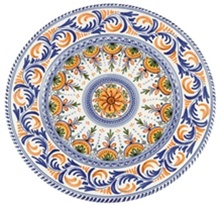 Spanish Majolica is produced in the Toledo Province of Spain, an area where the traditions of their forefathers have been maintained for centuries. All of the ceramic pieces in our Majolica Collection are carefully hand turned and hand painted in the centuries old art form. All of our Spanish ceramics are lead-free, food safe and functional as in our plates, bowls and Spanish Sangria pitchers. Each piece is unique in pattern due to the handcrafted nature of the collection. Click on Spanish Majolica to read our article on Spanish Majolica Pottery.